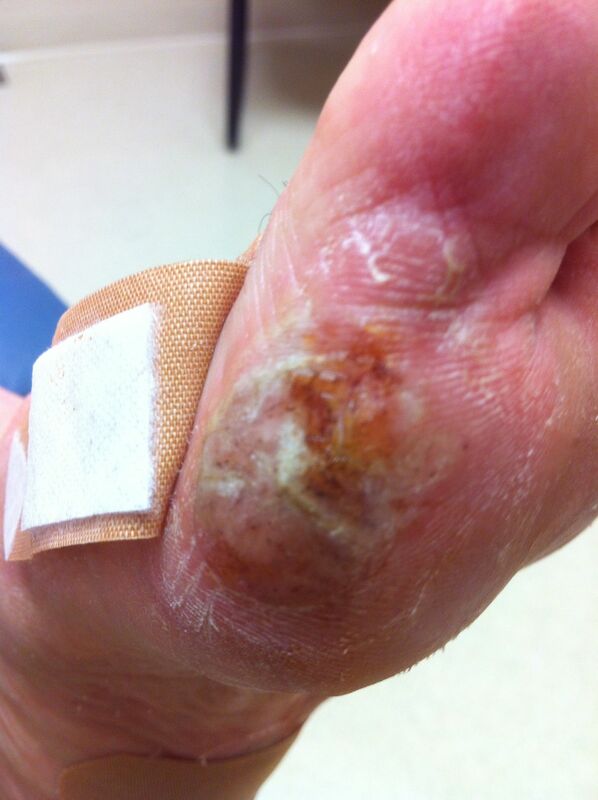 Warts, better known in Latin as, verruca, are very common skin problems of the body especially the foot. Twenty million cases of warts are treated by U.S. physicians every year. Warts are not a beautiful sight to behold, they can appear anywhere on the body but those that appear on the bottom of the foot are known as plantar warts. The wart may seem like a painful callus but nevertheless it is a wart caused by a virus. The papovavirus is a whitish, hard growth with black, brown, or red “pepper spots” (surface capillaries) within the center of the growth. Warts may be circular, well defined with a light ring around them separating them from healthy skin. They may often be mistaken for corns since layers of dead skin build up to protect the wart area because the skin is continuously irritated. Corns are not contagious; warts can be very contagious. Warts may grow as a single growth, in groups, or can spread from fingers to toe and visa versa. Warts generally begin to appear on the body during and after puberty (it is very, very rare for young children to get warts). Teenagers are more susceptible than adults to get the warts virus. What Causes Warts on My Feet? Exposing the feet to surfaces such as those of pool edges, locker rooms, gymnastics/wrestling mats. Other facilitators include: stress, menstrual cycles, pregnancy, diabetes, HIV/AIDS, and chronic sickness which compromises the body’s immune system. The wart virus thrives in warm, moist environments. The average life span of the wart is between 4-18 months. The breakout can disappear just as quickly as it can form, it can spread or shrink over time; more than one inch-per-lesion. The mosaic-cluster type most often occurs if it is not treated aggressively or precisely. Pain can occur when pressure and weight are applied to warts on the bottom of the foot, the sides, and in between the toes. A burning or sharp cutting sensation can be felt is too much awkward pressure if put on warts throughout the foot. Plantar warts are very difficult to resolve, but there are several ways to treat them. While over-the-counter topicals, creams, and devices exist for wart removal, at home treatment methods only temporarily treat the problem and can cause greater resistance against other treatment methods. There is no best way and there is no quick way for treating plantar warts. Everyone’s body responds differently to each treatment and is largely dependent on the quantity, location, and type of plantar warts on the patient’s foot. Regardless of the treatment chosen for you, the goal is to create anti-bodies to destroy the virus in your body. Complete cooperation with your doctor for any treatment course is essential for a satisfactory result. Since warts are a virus like the flu, you can have them more than once. Follow up treatments of 2-3 weeks is very important. If you think you might have warts or other growths on your feet, contact the specialists at Healthmark Foot and Ankle today.